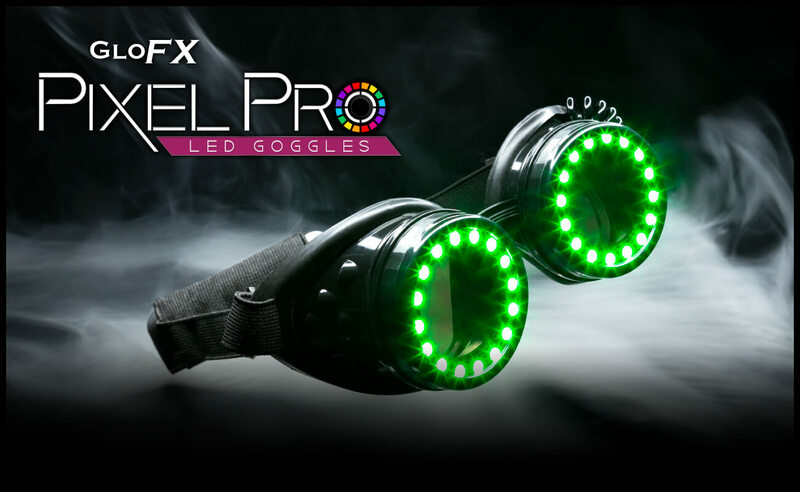 GloFX Pixel Pro LED Goggles are the world’s most advanced LED Pixel Goggles. With on-board memory, built-in USB rechargeable battery pack, and remote control, you can create a playlist of your favorite color patterns and modes with extreme ease. GloFX Pixel Pro offers over 350 customizable modes and a full color spectrum. Amaze your audience, stand out in the crowd, and light up your life with the out-of-this-world color and light patterns. The endless possibilities and color options are sure to please and provide a lifetime of entertainment. High Quality Hard Coated Black Polymer Frame. Adjustable Elastic Band – Built-in sleeve for a battery pack. USB Rechargeable Battery Pack Included – Average battery life of 5-7 hours depending on the mode. Additional USB Rechargeable Battery Pack – One battery pack is included with Pixel Pro LED Goggles, but get one more to stay charged all night long. Microfiber Carrying Case – Keep your Pixel Pro LED Goggles protected everywhere you go. GloFX Pixel Pro LED Goggles feature a fully customizable microchip complete with over 350 different modes including a full color spectrum. Pixel Pro features multiple solid color modes, strobing modes, and a whole range of animated options to choose from. There’s a mode to fit every mood, and go with any song! Pixel Pro LED Goggles feature a built-in battery so you don’t have to worry about a long cord or getting unplugged during intense dance sessions. The USB Rechargeable Battery Pack easily slides in and out of the adjustable strap so you can conveniently switch battery packs on the go! Pixel Pro LED Goggles are available in three lens options: Tinted Lenses, Clear Diffraction, and Rainbow Kaleidoscope. Tinted Sunglass lenses are easy to see through while your Pixel Pro Goggles are on. When wearing the Goggles with Tinted Sunglass lenses you will be able to see some of the light from the LEDs, but it will not impact your vision. Clear Diffraction lenses feature a single layer of diffraction which will distort your vision and cause any external light to turn into a sea of rainbows. When wearing the Goggles you will be able to see some of the light from the LEDs, but the LEDs will not impact the diffraction effect. Rainbow Kaleidoscope lenses feature maximum intensity crystal vision which will turn the world around you into beautiful rainbow fractals. When wearing the Goggles you will be able to see some of the light from the LEDs which can intensify the kaleidoscope effect.